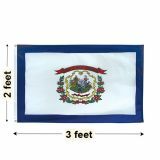 West Virginia state flag has a white field with a blue strop border on all four sides. In the center is the coat-of-arms of the State of West Virginia, above which an unfurled red ribbon with the text "STATE OF WEST VIRGINIA" appears. A wreath of the state flower, Rhododendron, is arranged appropriately around the lower part of the coat-of-arms. Our West Virginia flags are the best way to show your state pride and legacy. Offered in various standard sizes and the popular fabric choices of nylon and polyesters, these state flags from Tuff Flags are 100% made in USA and carry a guarantee of 6 months on construction.Shop from our complete line of West Virginia Flags right away and avail the best prices, quick shipping and much more! 100% customer satisfaction guaranteed! Our West Virginia flags are made to the exact specifications of the official flags and are made with beauty and the finest craftsmanship. Our commercial grade flags are well suited for schools, businesses and government organizations to display the state pride of the mountain state of West Virginia. Made of premium quality materials and finished with polysateen heading and grommets, these flags are designed to look great and last long. The colorfast Dupont inks that are featured in the flags will enhance its visual appeal. 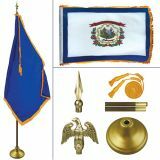 Choose from indoor flags, outdoor flags or indoor flag kit, which make fabulous gifts, keepsakes and display items. Browse our complete line of West Virginia State Flags and choose models that match your requirements. Need help? Call our toll free number (888) 287-3524 or email at customercare@tuffflags.com and we will be happy to assist.